Detailing the physical features, habits, territorial reach and other identifying qualities of the Lesser Maple Spanworm Moth. A frequent guest in deciduous and evergreen forests, the Lesser Maple Spanworm has one-of-a-kind markings to help identify it. Lighter and half the size of the Large Maple Spanworm Moth, the Lesser Maple Spanworm Moth's design makes up for what it lacks in wingspan. 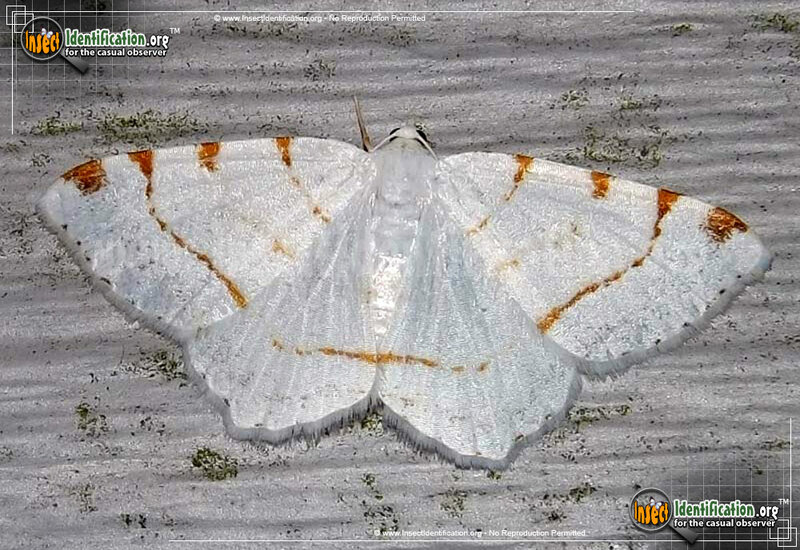 The bright, white moth has four brown marks on the outer edge of each forewing. Though the first and second marks almost cross, it is the third set of marks that span the wings with a thin brown trail, linking both sides. This line may also stretch across the hindwings. The fourth and lowest mark is bigger and usually has no line spanning the wing. A generously spaced black-and-white checkered bottom runs along all four wings. Antennae are white with orange-brown 'teeth' projecting from them like a comb. The face has an extended mouth part that almost resembles a beak. Females lay gray or pink eggs on a host tree in autumn, which will weather the cold and hatch in early summer. The slender, long caterpillar is green with yellow and green lines running down the 'spine'. It feeds mostly on maple tree leaves, but also enjoys eating from birch, poplar, fir, hemlock, and other trees. It pupates in midsummer and emerges as a winged adult before autumn. One generation is produced each year.